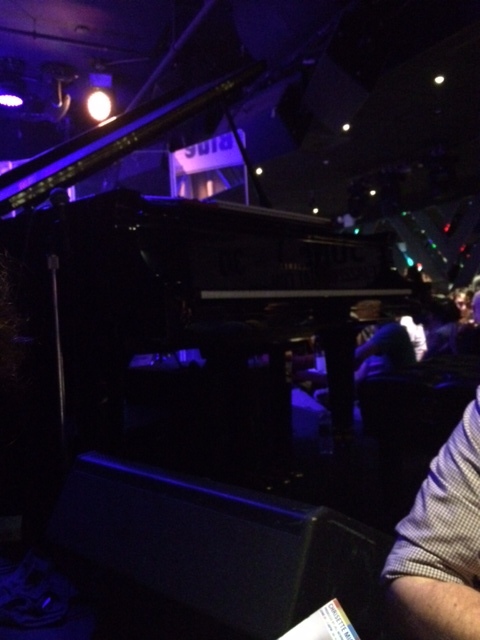 This past Sunday I went to see the jazz pianist Hiromi and her Trio Project play at the Blue Note Jazz Club. The pianist’s bandmates were Simon Phillips on drums and Anthony Jackson on electric bass. The musicians’ playing was virtuosic and as an ensemble they were super tight–almost telepathically so. I sat behind Hiromi and couldn’t see her two bandmates–until I realized that if I looked towards the mirrored far wall across the room I could see the head of Jackson and Phillips’ hands–but nothing else, obscured as the drummer was by his giant cymbals. Not bad, but who knew that seeing makes listening to live music that much better? I wanted to see what the musicians were thinking with their faces. So it goes sometimes. Given my interests, I was particularly moved by Phillips’ drumming. Playing matched grip, his sound was at once booming and crisply articulated, moving easily and instantly from rock time feels to double time swing. His cymbal work was a highlight here. From jazz time on the rides to the symphonic crashes, the cymbals sounded pristine every time he struck them–like important events marked with panache. It was hard to imagine this trio’s music functioning at all without Phillips’ rhythmic verve and presence. It’s in this regard that good drummers are so much more than steady “timekeepers.” The good ones can slice and dice time to the point that the drumming becomes the time. Unfamiliar with Hiromi’s music, I wondered while listening to the trio perform their airtight set just how much–if any–of their music making was improvised. It sounded composed. Most of the pieces had numerous clearly demarcated sections that dictated exactly how long anyone’s solo might last, ever-shifting odd meters marked by repeating piano riffs, as well as three-way unison flourishes, stops and starts. The grooves were without seams, and downbeat accents were never missed. Indeed, the set seemed a performance of pieces pre-worked out in their details, giving the trio a commanding ability to bring the audience on a calibrated musical trip. A day after the show I listened the group’s recent recording, Alive, and realized that the music was exactly the set I had heard at the Blue Note. One of the standout tunes is the angular and odd-metered “Dreamer”, which begins and ends with a moody four-chord piano sequence, accompanied by a delicately brilliant drum pattern that evokes Steve Gadd’s “Fifty Ways To Leave Your Lover” rudimental gear shifting. Like Hiromi’s Trio Project show at the Blue Note, “Dreamer” and many of the other pieces on their recording is an organized, fully thought through adventure that keeps changing and packs a wallop. In jazz does it even matter anymore if the music is composed or improvised?